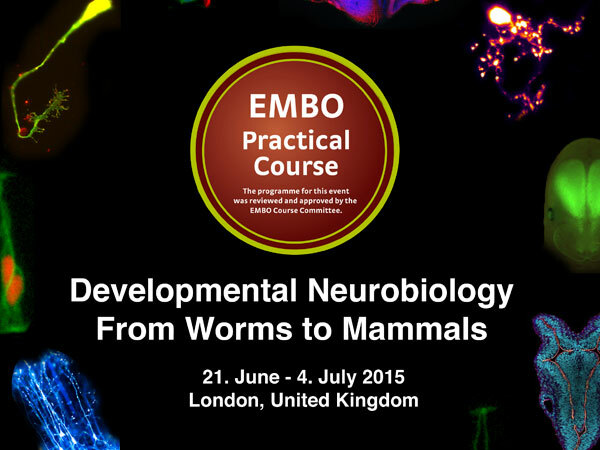 This June, the MRC Centre for Developmental Neurobiology will host the 4th EMBO Practical Course: “Developmental Neurobiology From Worms to Mammals”. Running since 2009, the 4th edition of the course will cover a broad set of techniques and model organisms in neurobiology. Students will also learn the state of the art techniques used in modern developmental neuroscience, acquire knowledge of brain development in 6 different species (C. elegans, Drosophila, zebrafish, Xenopus, chick and mouse) and interact with internationally leading neuroscientists. Each day there will be 2 or 3 hands-on practical sessions, thus allowing students to acquire strong practical skills whilst working in small groups, followed by a lecture seminar at the end of the day, held by international leaders in the field. Students will have to bring a research poster, which will be exhibited and presented throughout the 2 weeks. At the end of the course, the best posters will be awarded with a prize. Location: MRC Centre for Developmental Neurobiology, New Hunt’s House, Guy’s Campus, King’s College London, London. SE1 1UL, UK.